27.75″ w x 24.25″ d x 42″ h Weight 146 lbs. 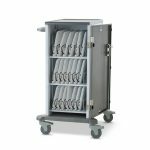 • Charges, Secures, and Transports 1 – 20 mini laptops like the Chromebook, Ultrabook, and Netbook in a strong, adjustable cart. 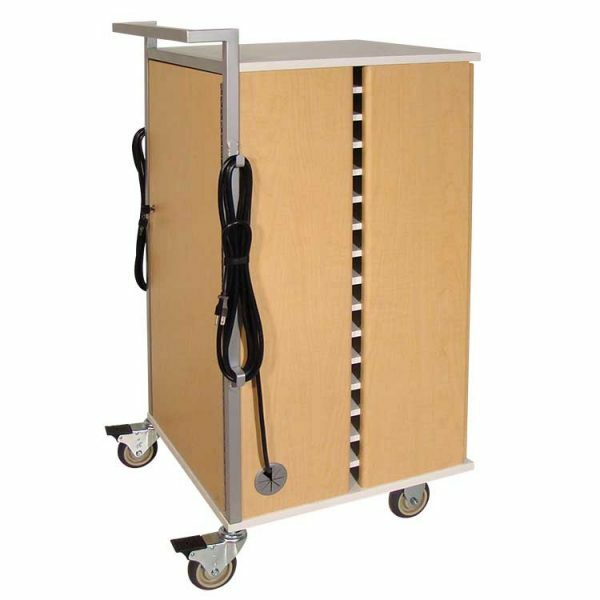 • Small Footprint, just 27.75” wide x 24.25” deep, fits into tight spaces and through doorways with room to spare. 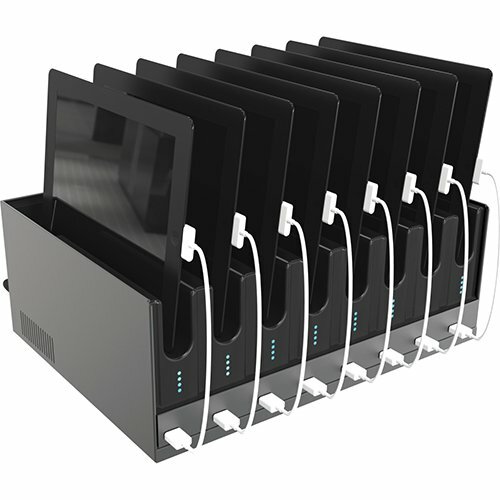 • Mix and Match with Tablets, eReaders, Handhelds and Smart Phones. 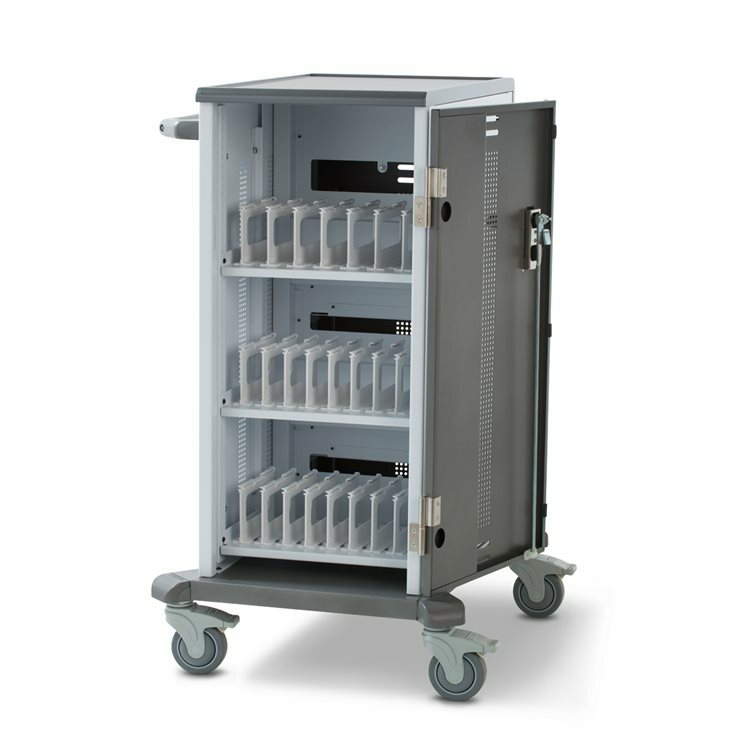 • Lifetime Warranty against manufacturing defects on the cart, 5 year warranty on the electrical system. Cords and plugs are not warranted. • Deep Front User Area supports all devices up to 13” screen and some with 14” screen. • Adjustable Shelves install at any height in 2/3” increments along the 27” high installation track. 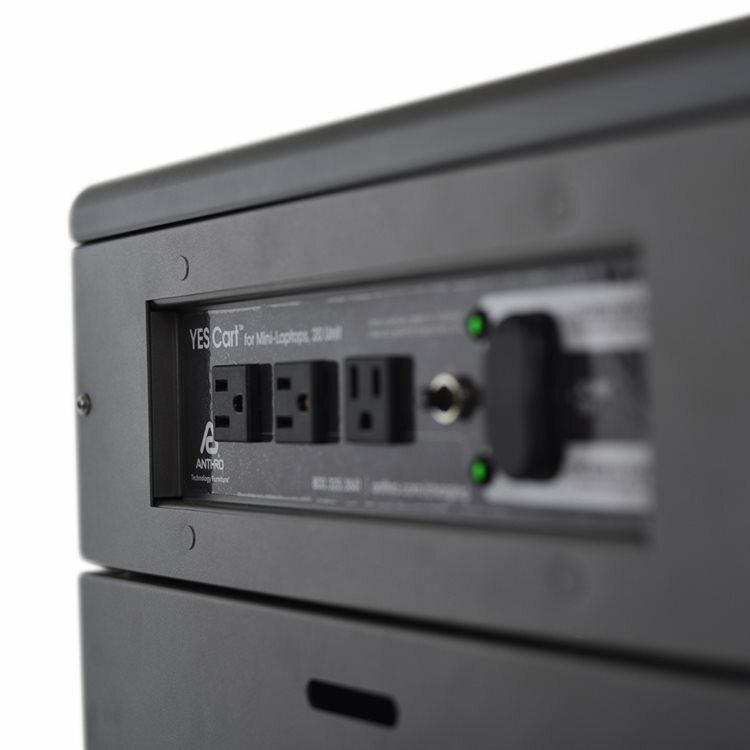 Store devices on their long side, in landscape orientation, or on their short side, in portrait orientation, as dictated by device size and the position of the power inlet and on/off button. Cart ships with shelves arranged for landscape storage. 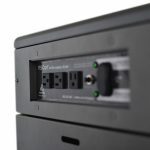 • Bay Dividers are made of molded ABS polymer and come with cable channels along the top to route charging cords right to the front of the bay. 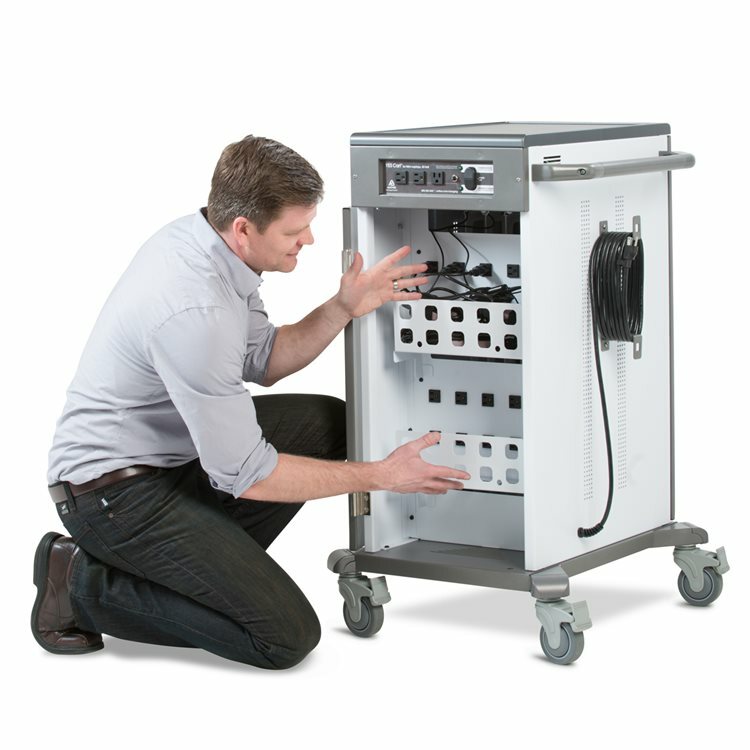 • Locking IT Area in back provides 20 power outlets and three roomy bins to hold power adapters and cord bundles. • Interface Panel under the handle has two external outlets to power your peripherals plus the on/off switch and indicator lights. • Power Cord is 14 feet long to reach as far as you need. Cord is stored on strong cord hooks nested under the handle so they’re safely out of the way and keep the cord convenient. 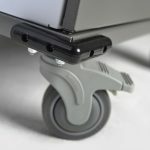 • Single Front Door opens 270 degrees so door lays flush against the side of the cart when open. Door panel is ventilated to keep air moving inside the enclosure. 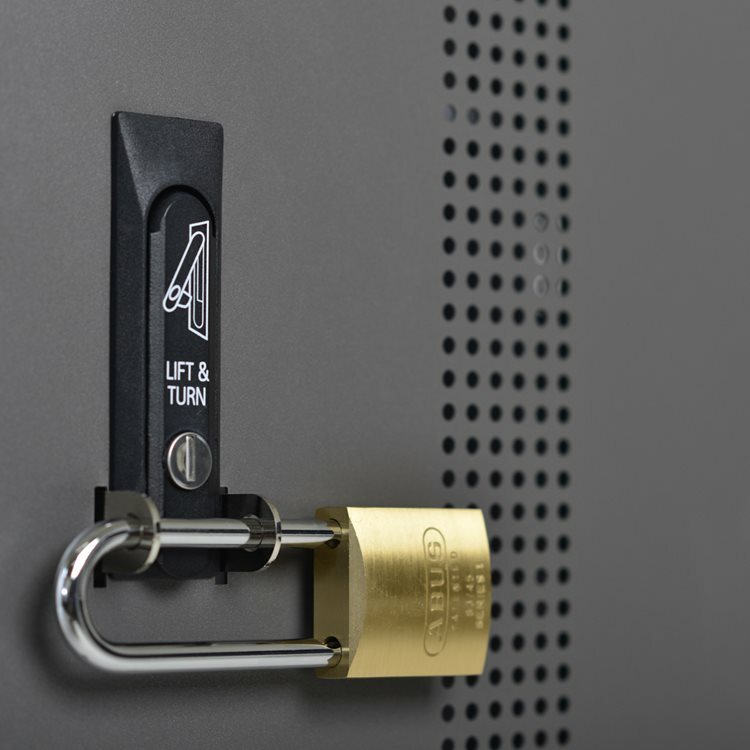 • Keyed Locks engage a two point locking system for security. 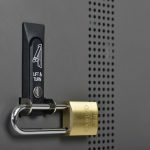 Padlock brackets position your padlock to block access to the front and back latches for extra security. 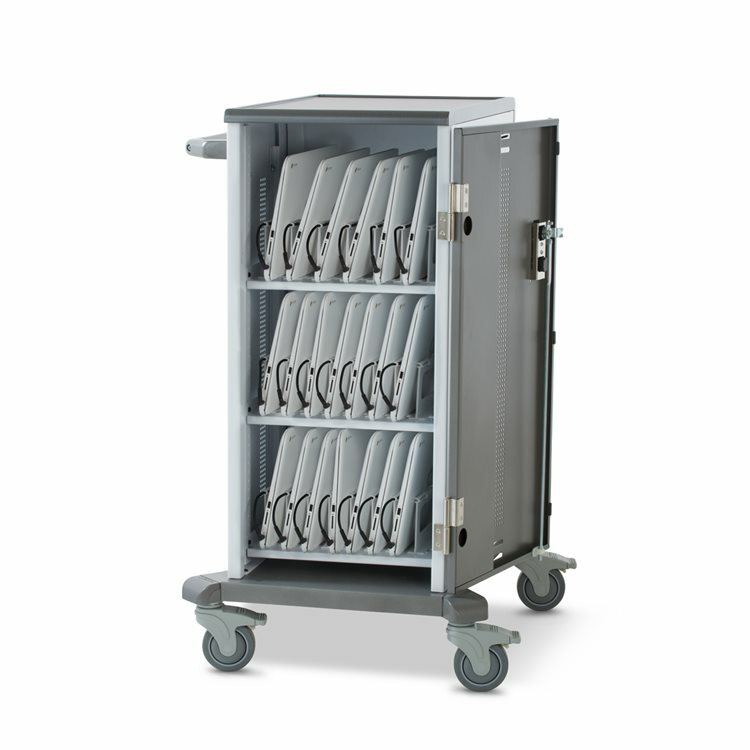 • Four 4″ Casters, 2 total lock, 2 directional lock, move the cart where it’s needed, even over rough surfaces. • Wide Handle with 13” grip sits at a comfortable 39” height and makes the cart easy to steer. • Top Surface is made of contoured wood with strong vinyl thermoplastic laminate for smooth corners and soft edges. 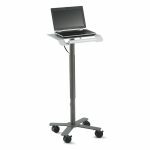 • Made with 14 and 16 Gauge Steel with durable baked-on powder coat finish. • Ships Assembled – just unpack and go! • Listed to UL Standard 60950-1 in the US and Canada for both the enclosure and the electrical system, so you know it’s safe.